The Puzzle Lady couldn’t be happier. Matt Greystone, the rookie sensation who just signed a huge contract with the Yankees after coming to the team as the player to be named later in a trade with the Diamondbacks, winning seventeen games as a starting pitcher, was coming to town to rehab from an arm injury. A diehard Yankee fan, Cora was delighted when Matt invited her to a weekend pool party. 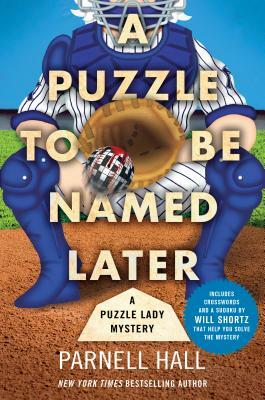 Solving murders is right up the Puzzle Lady’s alley. Unfortunately, someone has broken into the house of a local psychiatrist and rifled her patient files, and Chief Harper wants Cora to solve that, too. Parnell Hall is the co-author of the New York Times bestselling Teddy Fay thrillers. He is the author of the Puzzle Lady mysteries, the Stanley Hastings private eye novels, and the Steve Winslow courtroom thrillers. He is a Shamus Award winner, and has been nominated for the Edgar and the Lefty. He lives in New York City.